In this absorbing and suspenseful debut novel—reminiscent of Revolutionary Road and inspired by a little-known piece of history—a young couple must fight to save both their marriage and the town they live in. Can’t wait to read this. . .
I’m so excited for you, Andria. I tried to find you on FB today to send you a photo via FB Messenger, but can’t find you? Your book was recommended today on #TheSkimm! Is there a Kindle version yet? Yes, there is! 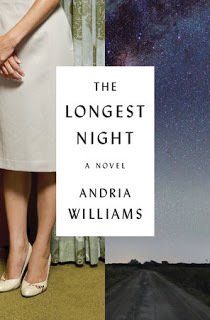 http://www.amazon.com/Longest-Night-Novel-Andria-Williams-ebook/dp/B00VZZ2LTW/ref=tmm_kin_swatch_0?_encoding=UTF8&qid=&sr= Thanks for asking! I am reading and enjoying this novel very much. However, as a resident of Pocatello, Idaho (50 miles from Idaho Falls), I feel you need to correct some misinformation before your book is released in paperback form. On page 14, you state that the land around the nuclear reactor was at one time used as the Minidoka Internment camp for Japanese Americans during WWII. That camp (and the shame that accompanies it) was instead located at Hunt, Idaho, about 220 miles west of the National Laboratory. Remnants of the camp are still at Hunt, and it has been listed as a National Historic Site. Just finished your novel and loved it. It was very informative regarding the reactor site etc. but I truly liked the characters and thought they were real people. You sure did good for a first book and hope you write many more. Thank you!! I really appreciate that you took the time to send a note! I am working on a second novel, set in the 1930s. Very much enjoyed your book! As someone who grew up in that era, your subtle details brought back lots of memories and feelings I had forgotten about. Cant believe you accomplished such a great debut novel while caring for 3 children. Looking forward to your next one. Thank you, Susan!! I’m glad to hear that the historical details rang true. Thanks for your thoughtfulness in dropping me a line! Thank you very much for this amazing novel. It made me travel through both time and space, being a french reader! My dad worked in the french army and I will give your book to my parents, who, I’m sure, will enjoy it as well. I can’t wait to discover your next work! Greetings from France, and merry Christmas ! Thank you so much for taking the time to leave me a note. I am so very glad you enjoyed the book. Did you read it in French, as ‘Idaho,’ or the American version? Thank you for reading, and Happy New Year! !